Jacqueline Garcia is not only graduating from Iowa State University. She’s also wrapping up her first year of law school at Drake University. Photo by Christopher Gannon. 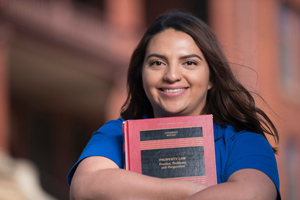 First-generation graduate Jacqueline Garcia is celebrating two milestones this month: She’ll receive her bachelor’s degree from Iowa State University and wrap up her first year of law school at Drake University in Des Moines. Garcia, who majored in political science with a minor in women’s and gender studies at Iowa State, has known for years that she wanted to be a lawyer. So, when she had to write a paper about career goals in her freshman political science course, she started researching different opportunities for pre-law students. She found the 3+3 Program, which allows Iowa State students to earn an undergraduate degree and a law degree in six years rather than the usual seven. The program is articulated through Iowa State’s College of Liberal Arts and Sciences, and students receive their bachelor’s degrees after the first year of law school at either the University of Iowa or Drake. Garcia will finish law school at Drake by the time she’s 23. Getting a head start in the 3+3 Program as a freshman meant she had a solid plan to finish her undergraduate work without having to cram courses at the last minute. It was an introductory women’s and gender studies class during Garcia’s freshman year that solidified her decision to pursue law. “They showed us how those issues intersect with political science, and it’s exactly the work I want to do – with nonprofits, low-income communities and underrepresented populations,” she said. This summer, she’s interning for the Iowa Coalition Against Domestic Violence. Garcia’s family is from El Salvador. They moved from California to Iowa when she was a toddler so they could be closer to her mother’s family in Des Moines. Growing up, Garcia was the go-to English speaker in her family. As a child, Garcia helped her family fill out paperwork and seek community services – an experience to which many first-generation college students can relate. Helping others, Garcia started seeing gaps between the city’s routine essential services – the legal system, family planning, health care, insurance – and non-English speaking communities. She started volunteering in Des Moines as she got older, and realized these issues still hadn’t been solved. In Garcia’s three years on the Iowa State campus, she dove in to not only her studies, but leadership opportunities outside of class. She joined the Bridging Opportunities in Leadership and Diversity learning community for multicultural students her freshman year, and served as a peer mentor for BOLD her sophomore and junior years. She’s a member of Lambda Theta Alpha, the first Latina sorority in the nation. And Garcia participated in the National Conference on Race and Ethnicity and the Iowa State Conference on Race and Ethnicity, calling NCORE and ISCORE “some of the biggest impacts” on her undergraduate career. Those events provided an opportunity to do in-depth academic research on issues relating directly to what she wants to do as a lawyer. “All of these things shaped me and helped me realize the work I want to do, and why I’m so committed to what I want to do after law school,” she said. Garcia wants to stay in Des Moines after completing her law degree. “It’s more meaningful for me to work in the community that impacted me,” she said. She said that while law school has been an adjustment with its own set of stresses, it’s been an amazing experience and has only furthered her dream of helping the community that raised her. In the end, everything Garcia does, she does for family. She hopes her pursuit of higher education will encourage her younger brother to study hard and chase his own dreams. “I want him to know that he does have the opportunity to do these things if he chooses,” she said. This article was originally published on the Iowa State University News Service. See the original article. blueView/Banner Planned Outage on Saturday, May 5 from 6 a.m. to 6 p.m.